Morning: I’m supposed to cleanse with Biologique Recherche’s Lait VIP02 both morning and night, but since my skin’s basically “clean,” I save product and just rinse with water. Georgia has me using two different Biologique P50 Lotions (cult product alert! ), and the one I use in the morning—1970 Balancing Exfoliator—has such a potent smell, I try to wait until my husband leaves for work before I use it (he’s not a fan…). I’m such a fan of P50, I actually like the scent. Anyway, I next pat Biologique’s Elastine Pure Serum Authentique on, then Environ’s C-Boost and C-Quence Serum 1. Once that has sunk in, I finish with Biologique Recherché Creme Aux Acides des Fruits. The Deciem side is much simpler: NIOD Copper Amino Isolate Serum, Hylamide Sensitive Fix Advanced Calming Complex, and The Ordinary Natural Moisturizing Factors. This current experiment has gone on for about three weeks. Have I noticed a difference yet? Not really…? Makeup is much more consistent, and both sides use the same products (I’m not that crazy): Being freelance, I’m outside during the day much more, so wearing sunscreen is more important to me. I usually use It Cosmetics CC+ Color Correcting Full Coverage Creme SPF 50+. I skip eyeshadow on weekends but always use a brown eye pencil on the waterline of my upper eyelid—usually from Tom Ford, Nars or Chantecaille. On weekdays, I like to use some level of a taupe or greige shade, so currently it’s Chanel Les 4 Ombres Multi-Effect Quadra Eye Shadow in Road Movie or Bobbi Brown Caviar & Rubies Eye Shadow Palette. I love how lengthening and clean Victoria Beckham Estée Lauder Eye Ink Mascara makes my lashes, and I get anxious that it’s running low! Finally, Clé de Peau concealer goes over dark circles and dark spots, then I pat IQ Beauty Sheer Activity Base on my cheeks as blush. Jane Larkworthy is an iconic, long standing beauty editor. Her expertise spans back to her time at Jane Magazine, then as the beauty director at W magazine, and now as a columnist at The Coveteur. She also has a blog called The Fraudulent Chef, among other creative endeavors. 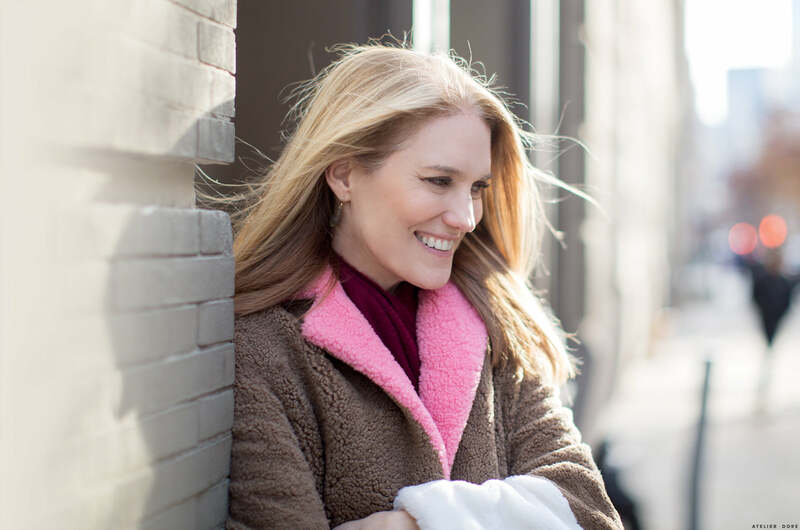 Jane is amazing, both as an authoritative (but so funny and so real) voice in beauty and lifestyle, and as a chic, modern New York woman. Jane m’a beaucoup fait rire… je suis contente d’avoir mis sur ma liste de Noël le mascara de Victoria, que je testerai donc à mon tour dès le 25 décembre. Quant au reste, je suis aussi très contente de ne pas être rédactrice beauté et donc de ne pas avoir à tester autant de produits ! plus j’avance en âge et plus j’essaie de simplifier ces rituels, mais bizarrement les flacons et pots continuent à s’accumuler, c’est un véritable mystère ! I love that jacket – may I ask where it is from? Her jacket is from Saks Potts!